Are you troubled by something, but not sure what. Is there something in your past that still haunts you or someone who still troubles you? An email psychic reading isn’t just about predicting the future. It’s about understanding the past and beginning the healing so you can face the future. Twin sisters and psychics, Sunhee and Chinhee have helped hundreds of people through their readings. 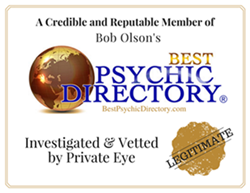 For 12 years they’ve been psychic healers and have appeared on a number of television programs. They specialize in helping people who have suffered from all forms of abuse, both physical and mental. Sunhee picks up on your negative physical ailments and Chinhee can feel your negative emotions and sees clairvoyantly what you look like. Their psychic reading will help you get on with your life and overcome your pain and suffering. Perhaps your schedule prevents you from getting a psychic reading in person or over the telephone. Or maybe you want to keep your reading private and not let others around you know your consulting a psychic. An email psychic reading is one way to get an accurate reading in confidence and at your leisure. If its two in the morning and you can’t sleep because you’re bothered by something the time to act is now, not on some day off in the distant future. You supply Sunhee and Chinhee with just your name, your birthdate and if possible, a photo. From that they will then begin your reading. You don’t get an immediate response because they take time for your reading, sometimes one to two business days. They want to give you an accurate reading, not just give you an immediate general response. Whichever sister does your reading will do it in a peaceful environment that allows them to focus on what they sense about the spirits around you. The email response they give you will be amazingly detailed. Often it runs two to three pages as they write down everything that they discover. This is a reading that will likely have an emotional impact on you and that you’ll read more than once and maybe share with those around you. If you’re truly serious about a psychic reading you might want to consider a reading over the telephone. Although your email reading will be just as accurate, one advantage to a telephone reading is that the vibrations in your voice may reveal even more about you. A psychic reading can impact how you feel about yourself and how you relate to others.